take a child by the hand. Start your long distance sponsorship now! Together we can offer education to Nepalese and tibetan children, preserve their cultural roots and cover their basic needs. If they attend school, they are also protected from child trafficking and labor, particularly in Nepal. Education is the key in order to give these children their stolen future. Take them by the hand. If you think about it … it is less than the cost of a cup of coffee. Start a Long Distance Sponsorship with ASIA and you will receive the personal story and the photo of the child you will be supporting. You will also have the chance to know her/him personally through the exchange of letters and photos and by visiting the schools we support in ASIA. 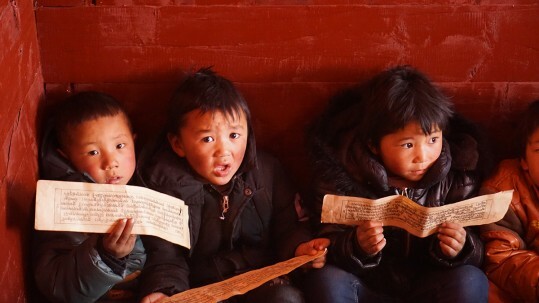 The school is asking for a long-term support to help the poorest students’families buying, every year, the necessary winter and summer school uniforms (which may be similar to the typical Tibetan monks’ robes), medical assistance, educational material, coverage for travel expenses. While we were visiting the school Karma showed us the teaching programmes that the various classes were following. We were very struck by the fact that the children were learning three languages: Nepalese in order to live in their host country, English to live in the world to come and Tibetan not to forget their roots. It moves me greatly to have done such a small thing for me, but very important and big for Ma Jiu Cao. I am very proud of her... and of myself too! And I hope that it will help for her future. Now, in the process of writing my first letter to Yantso Kyid, I will tell her about my life here in NYC, mostly a good life, but lots of hard work... Sometimes you lose the meaning of it all, so knowing that through my support I can change someone's life for the better, warms my heart & really makes my day. My family and I went to meet Tenzin, the little girl we support through ASIA in India. We returned with a suitcase full of smiles, kindness, gratitude, respect, sharing, love. Upon my arrival, the reception was very warm, as the Tibetan tradition wants. With joy I had the chance to see that Tenzin used the opportunity given to him in the best possible way. When we went into the building, little Tenzin, the child I have sponsored for more than a year at the Manasarovar primary school, was waiting for us at the door: handsome, very thin and with shining eyes. I have known ASIA by chance. Unlike other similar initiatives, I was struck by the "target" of children to be distance supported: those of Tibet, the "roof" of the world, perhaps children more in need than others.